Golden Scarab bewitches us! 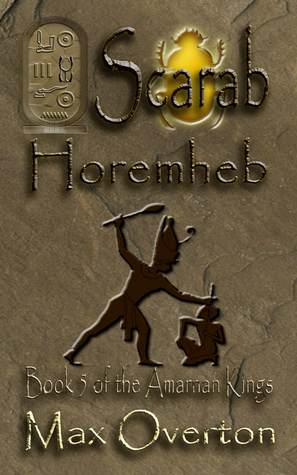 Scarab, previously known as a no-name child of King Nebmaetre of Egypt's Middle Kingdom, then named Beketaten, who in previous books of Overton's series came of age (Bk 1), fought against her usurping Uncle Ay on the side of her brother Shmenkhkare (Bk 2), continues the battle alongside her older brother Shmenkhkare against the cruel and ambitious Ay and her younger brother Tuthankamen (Bk 3), finally falls under the power of King Ay's adopted son Nakhtmin, then turns the tables on her worst enemies, clearing the way for Horemheb to come to power and her ex-lover Paramessu to become Horemheb's successor and eventually her son Set to sit on the throne of Egypt (Bk 4). In The Amarnan Kinds Book 5: Scarab - Horemheb, Overton combines his story with the Biblical story of the Hebrews' escape from Egypt, with former King Ahkenaten resurfacing as Yahmose (Moses) aided in the Hebrews/Khabirus' exodus from slavery in Egypt by Jesua, a warrior follower of Scarab. This tale has been 'read' to us from the beginning by a British female archaeologist Dani, who has found Scarab's tomb, apparently, in modern-day Syria, on the walls of which the aging Scarab had recorded her life story. It emerges at the end of Book 5 that Scarab is not buried in the tomb in Syria, as we had thought all along, but that her husband Khu had taken her body to her brother Shmenkhkare's hidden tomb in Egypt and secretly buried her there. So the stage is set for Book 6, where archaeologist Dani, apparently a descendant of Scarab's, is going to wield the golden scarab she found in the Syrian excavation, to assist her as she deals with unearthing her ancestor's body and story and fending off the efforts of a Saudi Arabian official who threatens the lives of the British archaeologists as well as the integrity of the history of Scarab. If this sounds a bit far-fetched, it is to the credit of the storyteller Max Overton that it all goes down smoothly, and delightfully, as Scarab's marvelous resilience and resourceful character grow slowly from the little girl playing with a dung beetle in Book 1 into the queen wielding the power of the gods of Egypt in Book 5. She restores Ma'at, the balance of justice and peace, to her country, just as any good fictional heroine should. We wait on Book 6 of The Amarnan Kings: Scarab - Descendant to see if Dani can do as well as her ancestor against the greed and ambition of present-day despots! Reviewed by Lee Ashford for Readers' Favorite.“Scarab – Horemheb: Book 5 of the Amarnan Kings” by Max Overton is another exciting and action-packed episode in the life of the – presumably – fictional Scarab, a daughter, sister, niece, mother, wife, and grandmother to various Pharaohs of ancient Egypt. This chapter in her life continues to narrate many and varied adventures and misadventures with which she had to cope. Overton writes as if he himself were present during the life of Scarab. He draws upon a wealth of knowledge about ancient Egypt, and communicates such detail as to make it necessary to keep reminding oneself this is fiction. In a masterful touch, Overton incorporates Biblical accounts from the book of Exodus into his fictional tale, adding another layer of authenticity to the entire series. Scarab experienced numerous acts of supernatural intervention in her life, as did her brother, Yahmose, from different gods of the time, also consistent with many Biblical records.Overton’s ardent devotion to the authentic depiction of ancient Egyptian royalty, and the incessant threat of subterfuge, deception, and disloyalty even among family members, rings so true one can scarcely understand how he could come by his knowledge. This story, and this series, is not some mediocre fictional account cultivated from some dream he had; rather, this reads like a true historical presentation told in such a way as to consume the reader’s full attention, and place him in the thick of the action. It may well instigate sleep deprivation in the reader, owing to an unquenchable need to continue reading until he reaches the end. Everyone with an inkling of interest in ancient Egypt must read the epic tale of Scarab and the Amarnan Kings. This entire series was an amazing way of looking at the 18th Dynasty as opposed to what we know from the history books. Why couldn't Smenkhare and Tut have died at the same time? There are so many other "why couldn'ts" and "what ifs." So many times throughout the first five books, and caught myself smiling at the in-depth research and story telling of these "what ifs." I would absolutely recommend this series to anyone who loves ancient Egyptian culture or anyone who loves court intrigue and epic story telling!This book had a major twist that I was NOT expecting. It bothered my at first, having grown up in a Christian household. What's funny is, I no longer follow those beliefs, and have a very scientific approach to religion, yet I found myself saying "That's not true." The beauty of this book is it could have been true. And even if what Overton writes is not true, it's opens your mind to so many alternate histories that could be out there from what we are told. How he interwove the Bible and Ancient Egyptian culture...and sort of brought both down to earth really got me in the end. I absolutely loved it. A very good storyWithout any compromise with known history, an excellent narration of the end of 18th. Dynasty of Ancient Egypt. Some Egyptologists have already theorized that Akhnaten and Moses are the same person. I needed to read this to just finish the story and see what happens in the end.